The Product: Hat? T-Shirts? Aprons? We Make Your Marketing Idea a Reality! 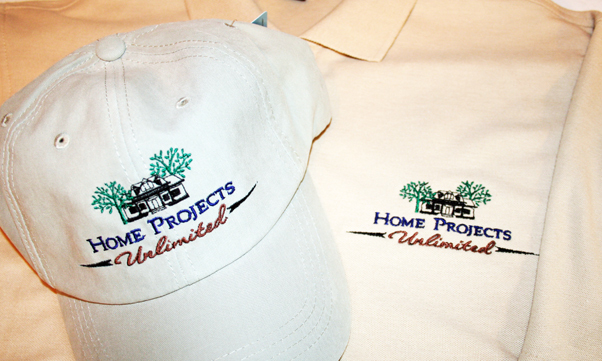 What is the process (and associated costs) when you send a design to us for embroidery? (1) We will need to have our artist redraw it in vector format -- there is a setup charge for this. (2) The file will then be converted to the correct embroidery format -- depending upon the complexity of the design, there may or may not be a charge for this. (3) Once the design is ready for embroidery, there are costs for the materials and equipment needed to sew the design onto the final product: The product itself (such as a hat, a shirt, an apron, etc. ), plus threads and backing, and sometimes some finishing work such as packaging. (1) We may need to have our artist redraw it in vector format -- there may be a setup charge for this depending upon the complexity of the design..
(2) The file will then be converted to the correct embroidery format -- again, depending upon the complexity of the design, there may or may not be a charge for this. (1) The file will just need to be converted to the correct embroidery format -- again, depending upon the complexity of the design, there may or may not be a charge for this. (2) Once the design is ready for embroidery, there are costs for the materials and equipment needed to sew the design onto the final product: The product itself (such as a hat, a shirt, an apron, etc. ), plus threads and backing, and sometimes some finishing work such as packaging, and if applicable, shipping. Note: If the design is a highly-detailed design or a design with a lot of enhancements such as shading or embossing, regardless of whether it is a bitmap or a vector file, it may need to be redrawn to be used for embroidery. As awesome as embroidery looks, there is a limit to the detail that can be depicted using thread! The size of the final product may also affect whether or not the design needs to be redrawn. Computer images can be either vector or bitmap images. Think of a bitmap as a flat photographic-style image (or painted drawing) of your design; it looks nice on a piece of paper or on a computer screen, but making changes to a bitmap design has serious limitations. You can change some colors if it is a high quality design (300 dpi screen resolution or better), or maybe edit out sections of the design, but that's about all. A vector image is also a computer image, but it is an actual computer drawing with the underlying lines, curves, nodes, etc. Typical vector image formats are AI, EPS, and CDR. Because vector files have colors and image sections separated, they are much easier to edit. What is the difference between Digital Image and a Digitized image? A digital image is a computer image of any kind, i.e., PNG, JPG, PSD, AI, EPS, TIF, GIF (and many more formats). A digitized image is a file that has been converted to a particular embroidery format, such as OFM, DST, etc. 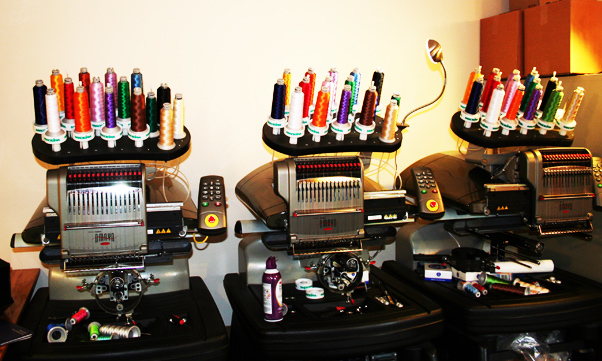 Different embroidery machines use different formats. The conversion process is rarely as simple as pushing a computer key; the machine must be told the correct order of elements to be embroidered, the types of stitches, bordering if needed, the color changes, the density of the threading -- just to name a few of the variables that can affect the outcome. If it is not done correctly, the final product will have unsightly gaps or excessive criss-crossing, resulting in bulges in parts of the design. We have three professional Melco machines to get your job done quickly! We use state-of-the-art equipment, and our experience gives us the edge over our competition. The software directs the machines to change threads. Once it's set up properly, we can run all three machines simultaneously. 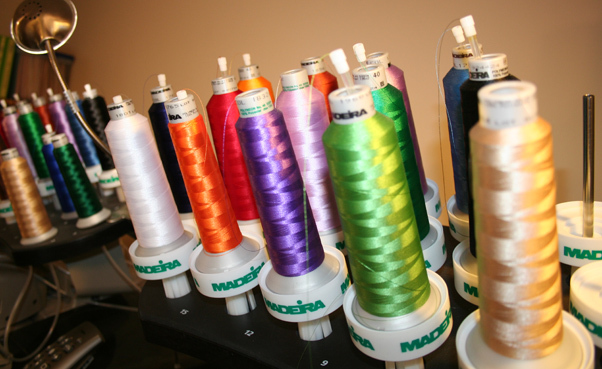 Your logo, brought to life using the rich quality of embroidery threads, sets your business apart from others. The Result: Your Marketing Goals Achieved! The same design can be embroidered on a variety of products from hats to polo shirts and more. A professional image is easy to achieve -- let us make your company look great! No job is too large for us, but we do small jobs, too -- and we deliver promptly.